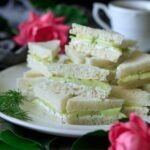 This easy cucumber sandwich recipe is a dainty appetizer to serve at an English tea party, Easter brunch or bridal shower. Thinly sliced cucumbers, cream cheese, and fresh dill fill these fancy triangle sandwiches to make the perfect finger food at your next ladies' party. Cucumber sandwiches are perfect for an Easter brunch, ladies tea, or a light lunch. 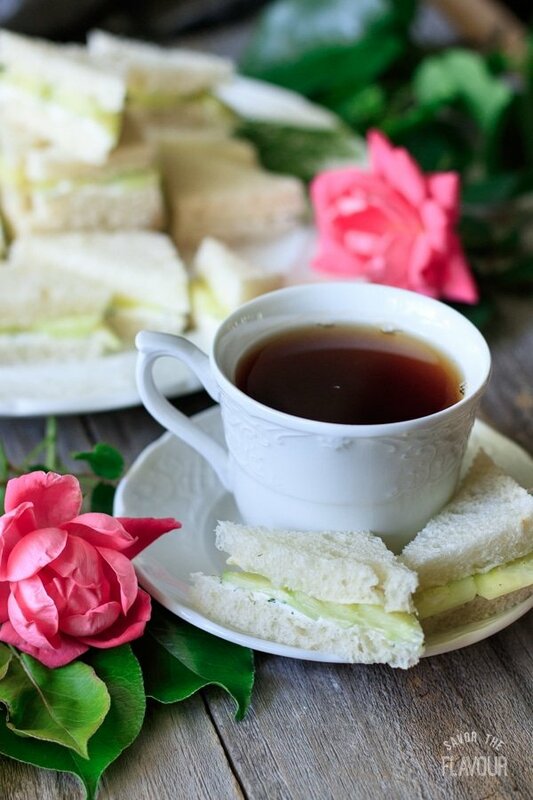 Traditionally served in England in the late afternoon with a cup of tea, cucumber sandwiches make an excellent light snack. There’s a reason why these delightful sandwiches have been very popular in the UK since Victorian times! Across the pond, there is much debate about how to make cucumber sandwiches and what techniques to use. Should you peel the cucumbers or only score them? Should you slice them into rounds or cut them into strips lengthwise? Should you remove the seeds to prevent sogginess? Many people like to salt the cucumbers to draw out some of the liquid and bring out its delicate flavor, and many others like to dunk the cukes briefly in white wine vinegar or lemon juice to bring a burst of acidity. That’s not all, as some chefs prefer to layer the cucumbers by slightly overlapping them. The cucumbers aren’t the only component of these sandwiches that’s under speculation. The classic bread for cucumber sandwiches is a soft white bread with a fine crumb, but some prefer a heartier brown bread. For elegant affairs, cut off the crusts; for more casual events, you can keep the crusts on if you’d like. Others argue about using salted or unsalted butter, and what thickness it should be spread. Should additional fresh herbs be added like chopped dill or mint? Should any aromatics be added like minced garlic or freshly ground black pepper? Should white pepper be added to give a hint of spiciness? Americans like to add cream cheese, but the English think that cream cheese makes it a cheese sandwich instead of cucumber! Hopefully, I given you some food for thought. 😊 What side of the cucumber sandwich debate do you stand? Regardless of what side you take, you’ll want to serve your freshly made cucumber sandwiches with other teatime dainties like these lemon scones, incredibly easy coconut macaroons, and French macarons. Looking for more dainty treats? Here’s some delicious ideas to get you started! 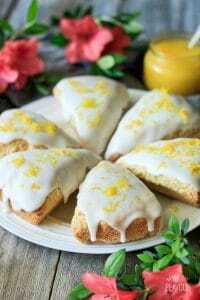 Easy Glazed Lemon Scones: a delightful lemony treat perfect with some homemade lemon curd. Incredibly Easy Coconut Macaroons: no mixer is required for these chewy coconut cookies. How to Make French Macarons: grow your baking skills by making these classic gluten-free meringues. The pleasure of a 5 star review of this easy cucumber sandwiches recipe would be greatly appreciated. 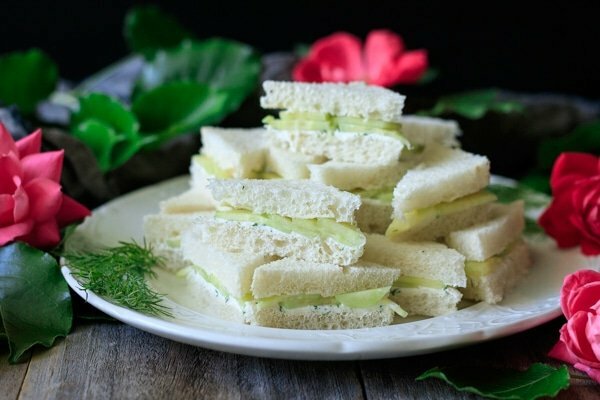 This easy cucumber sandwich recipe is a dainty appetizer to serve at an English tea party, Easter brunch or bridal shower. 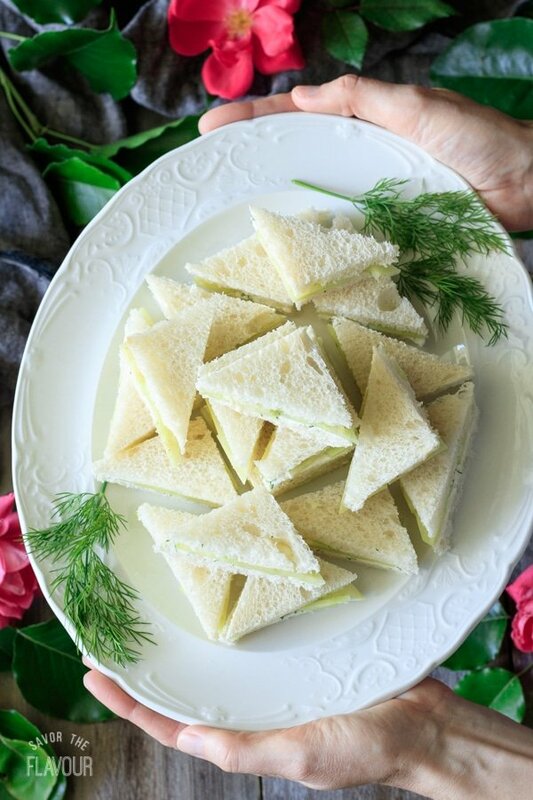 Thinly sliced cucumbers, cream cheese, and fresh dill fill these fancy triangle sandwiches to make the perfect finger food at your next ladies’ party. Peel the English cucumber, then very thinly slice it into rounds. Put the slices on paper towel, lightly salt, and wait 20 minutes. This will draw out some of the liquid, make the cucumbers firmer, and bring out the delicate flavor of the cucumber. When the timer goes off, blot the cucumbers to take off excess moisture and salt. Wash and pat dry the fresh dill. Chop it up and place it in a bowl along with the softened cream cheese. Stir with a spoon until well combined. On a large cutting board, lay out 12 slices of bread. Lightly butter them using unsalted butter since there will be enough salt in the cucumber rounds. Spread the cream cheese with dill on 6 slices of bread. Squeeze the juice from one lemon into a small bowl, then quickly dip the cucumber slices into the lemon juice one at a time. Carefully place ten or twelve overlapping cucumber rounds in two rows on top of the slice with the cream cheese. Sprinkle with white pepper. Place the other bread slice on top of the sandwich. Using your hand, press down on the bread as you cut the crusts off, then slice the sandwiches into fingers, squares, or triangles. For the picture, I cut each sandwich into four triangles. Serve immediately for best freshness.